Having pain or numbness in your feet on long rides? Just can't find a road cycling shoe that fits right? New and now in stock at Century Cycles are the Bont Riot, the world's first carbon composite heat-moldable entry-level road cycling shoe. At $149.99 per pair, they offer pro race-ready performance at a beginner's price. Heat-moldable means you customize them to fit YOUR feet. Plus, your feet change over time, so you can re-mold them AGAIN and AGAIN! The Bont Riot's wide toe box doesn't squeeze your metatarsal bones like typical cycling shoes, which helps eliminate numbness and hot spots. The medial arch support promotes proper tracking of your knees. Improper knee tracking is a leading cause of knee pain and lower back pain! Cookable shoes. Yes, you read that right -- just pop them in the oven to make the chassis mouldable, then put your foot in to create a custom fit. The result is something else. Arch support is noteworthy, too, and while these are stiff, no-frills race biased shoes, we found no comfort issues on three-hour rides. Mesh in the uppers provides venting, the single velcro strap is simple to use, and the ratchet is child's play. A clear winner. 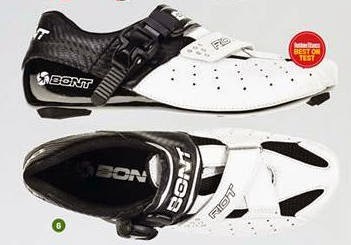 We have a selection sizes of the Bont Riot Road Cycling Shoes in stock in our Medina store. Stop in to try them on! Closer to another store? Call us, and we can send your size to Peninsula or Rocky River.